Whether you're singing along to trap rappers or making a quick getaway, skrrt is onomatopoeia for the sound of tires screeching. It's especially used as an excited interjection in trap music and by fans of the genre. When it was time for Malcolm Davis to pick a rap name, he opted for MadeinTYO, pronounced “Made in Tokyo,” as a tribute to the Yokosuka naval base where the military brat spent his formative years. But as far as his music is concerned, he is all Atlanta. Everything he has released since his breakthrough in 2015 has shared the hallmarks of his adopted hometown: bare-bones lyrics, infectious hooks, and “skrrt skrrt” adlibs sprinkled over bass-heavy trap beats laced with video game synths. Where does skrrt come from? Since the 1990s, speakers especially in black communities have been using the sound skrrt as a reference to a fast-moving car, mimicking the sound the tires make when they squeal on the pavement after sudden acceleration. According to some internet theorists, skrrt is also the sound of a fork scraping against the side of a pot during the drug-cooking process. These theories are largely unsubstantiated. The term has become popular since the end of 2015, coinciding with the rise in trap music, which often includes the word as an ad lib. In hip-hop, an ad lib refers to a signature vocal filler, like when Kanye West peppers songs with Yuh! or Kendrick Lamar with Let’s get it! 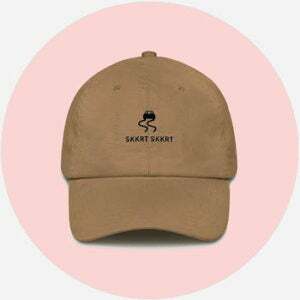 Some trap songs even use skrrt in song titles, such as 21 Savage’s 2015 “Skrrt Skrrt.” The word has become so associated with this genre—whose lyrics are concerned with drug-dealing and quick getaways—that entire playlists have been dedicated to songs that feature skrrt‘s. Many users use skrrt in its original reference to the sound of tires, though often just when talking about a speeding car rather than one specifically being used for a getaway. Turns out, you can skrrt (or, for emphasis, skrrt skrrt) on anything with wheels, not just cars. Just take Jaden Smith’s word for it, if he slows down enough to tell you about it while buzzing by on his suitcase scooter. It’s most common, though, to see skrrt used as a generic, high-energy interjection in songs by Southern trap or “mumble rap” artists (such as Migos) and in reference to or parody of their music. In that vein, speakers often include skrrt as a general way to convey excitement, confidence, or swagger.